This is a stage version of a masterpiece written by Oscar Wilde, presented by Theatre Moments actors who talk to the audience more than usual while delivering ethical issues with objective and realistic point of view. 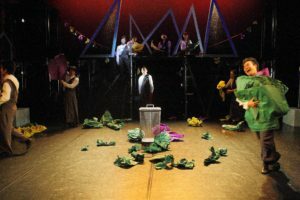 The company has performed this piece outside of a theatre such as at primary school. The company stages Kafka’s famous novel, beginning with a scene in which Samsa, the main character, finds himself changed into a cockroach one morning when he wakes up in his bed. Using physical theatre and sudden shifts in the cast, the director depicts a dream like unstable world. 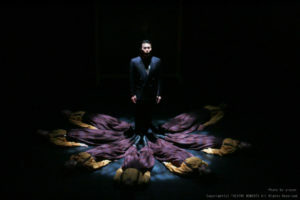 He builds an uncertainty, which the original text implies, in the audience’s minds by using metaphors of current issues such as nursery care for elderly and withdrawal. The company interpret the text based on an idea that a common couple kills others after receiving a little prophecy, which can be equivalent to information on TV or magazines in the current world. The piece successfully encompasses a comparison between a theatrical situation in the original text and real issues in the present days; Macbeth being swayed by witches’ prophecies and people being misled by too much information in the modern world. 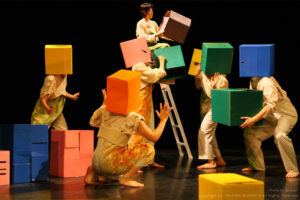 With 60 removable cardboard boxes and 2 ladders, the actors present imaginary cherry trees in bloom and ending of flowers and human lives on the stage. This almost mythical world is created simply by actors’ body and their rich expressions. All actors except 2 main roles wear a cardboard box over the head and symbolize anonymity and alienation among the crowd. Daisuke Sagawa’s direction implies transience of life that all are going to fade away and return to nothing by inserting lines telling today’s incidents.